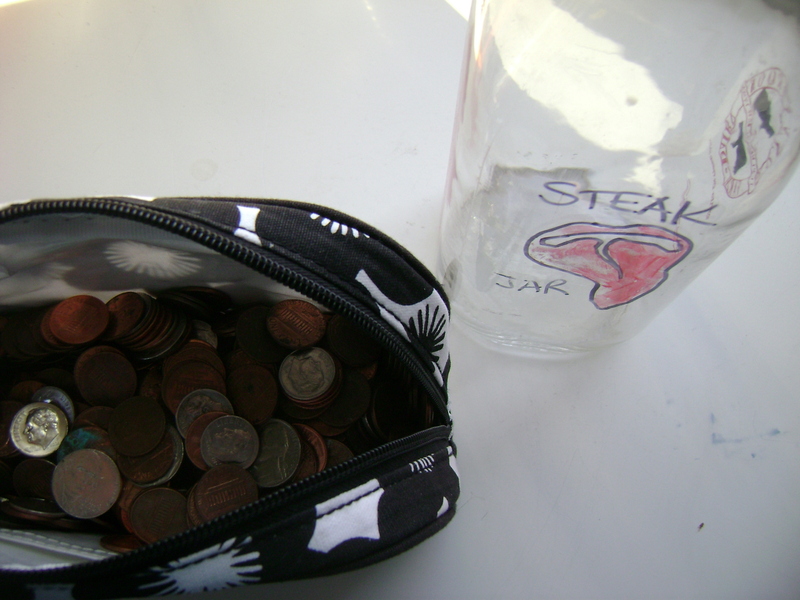 Remember the Steak Jar? Well the time has come to crack it open, pour its contents into a purse and cash it out for dinner! It took a few months of concentrated effort and dilligently not paying with exact change to accumulate enough money to have a tasty steak dinner. The Brown Beear can really pack it away, so I have to buy a lot! Feel free to tailor this recipe to fit the size of your appetite! 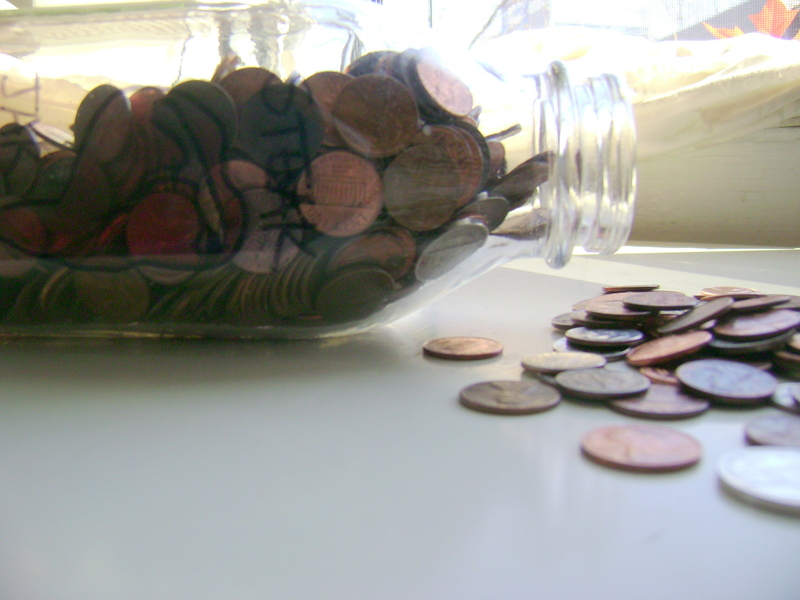 I filled up my cosmetic bag with the pennies nickles and dimes and went over to TD bank. They have a handy coin counter and they convert your coins into the kind of money that crinkles. They even will do this you aren’t an account holder at their bank! How nice! 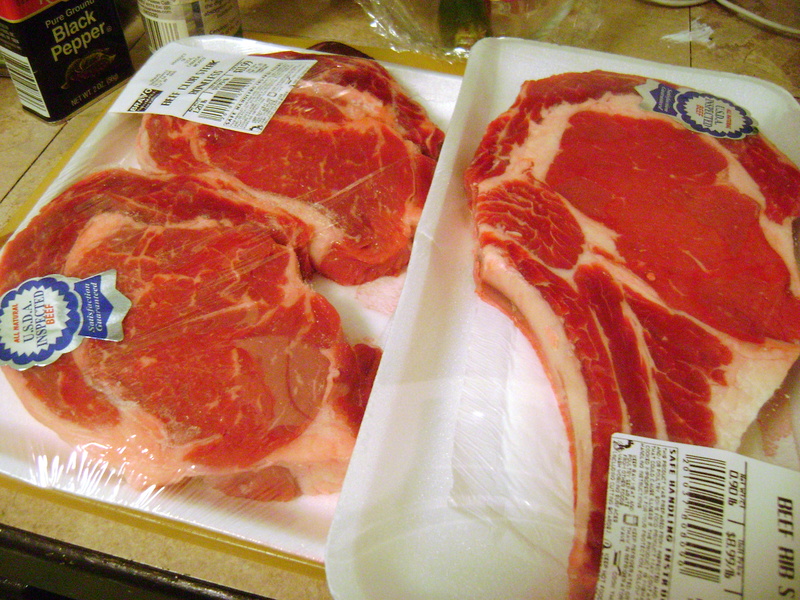 Then I walked over to the supermarket and bought some beautiful steaks, cremini mushrooms and pretty purple onions. We’re in business! 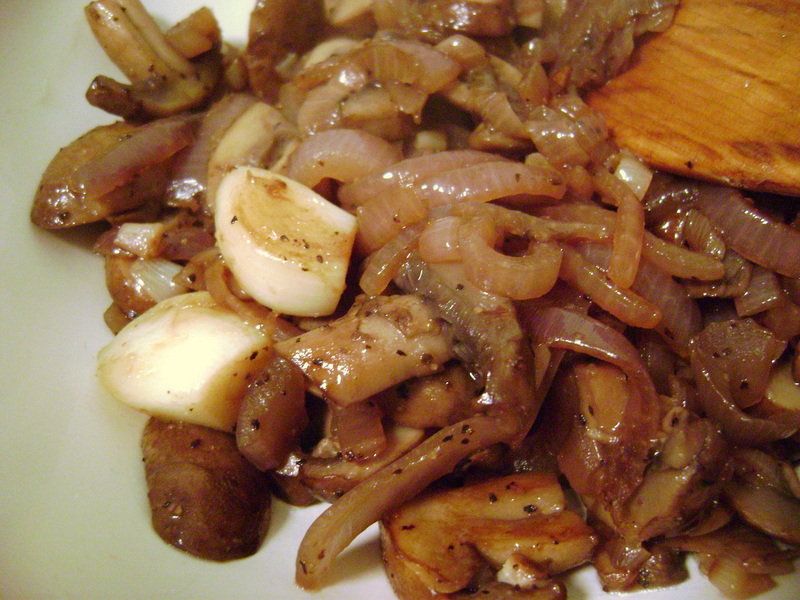 I put some potatoes on to boil wile I trimmed the onions and sliced them into pieces, and chopped the mushrooms into rustic-ly thick slices. I used the flat side of my kitchen knife to slightly crush and peel my garlic cloves. I like to leave them whole. You’ll see why in a bit. 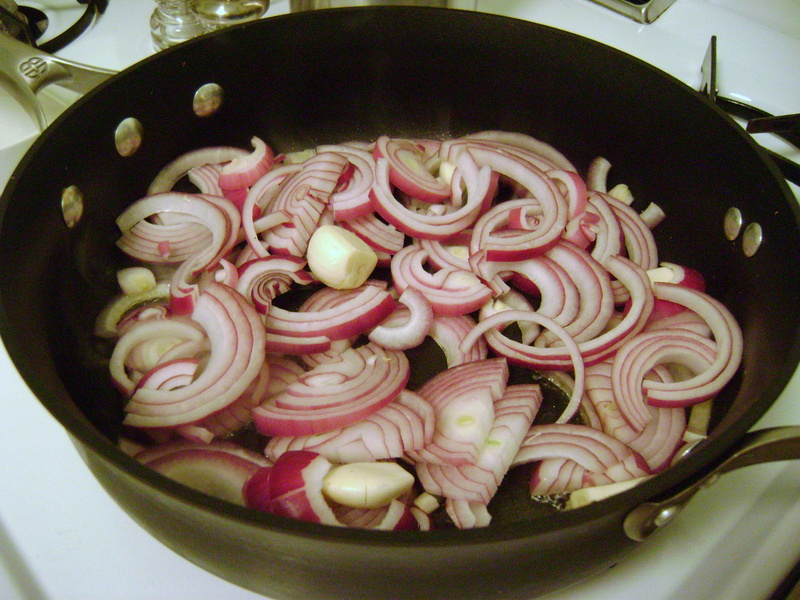 The onions and garlic go into the pan until they are slightly cooked. 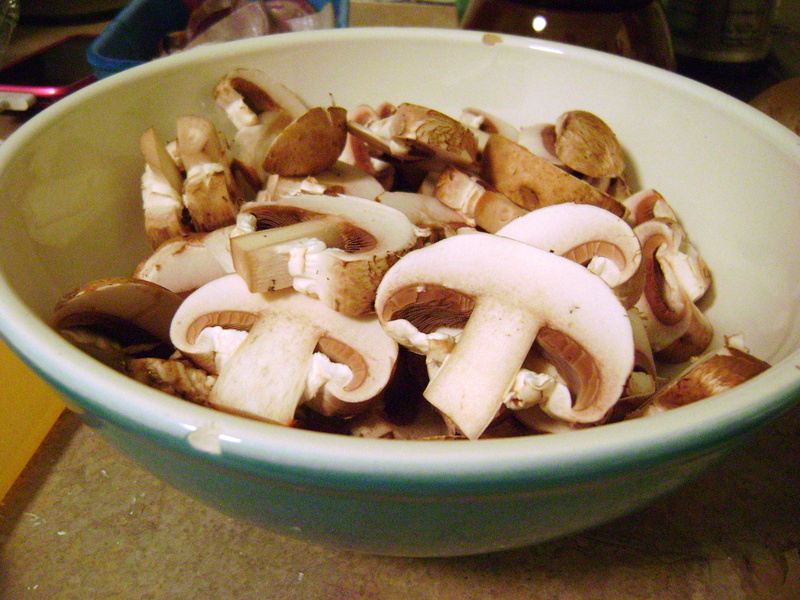 My beautiful mushrooms are ready, waiting in the wings. I like them to be meaty mouthfulls so I try not to make them too small. They get smaller as they cook. At this point I like to cover the pot. Mushrooms carry a lot of water and covering them forces it out. Look at all that steam! 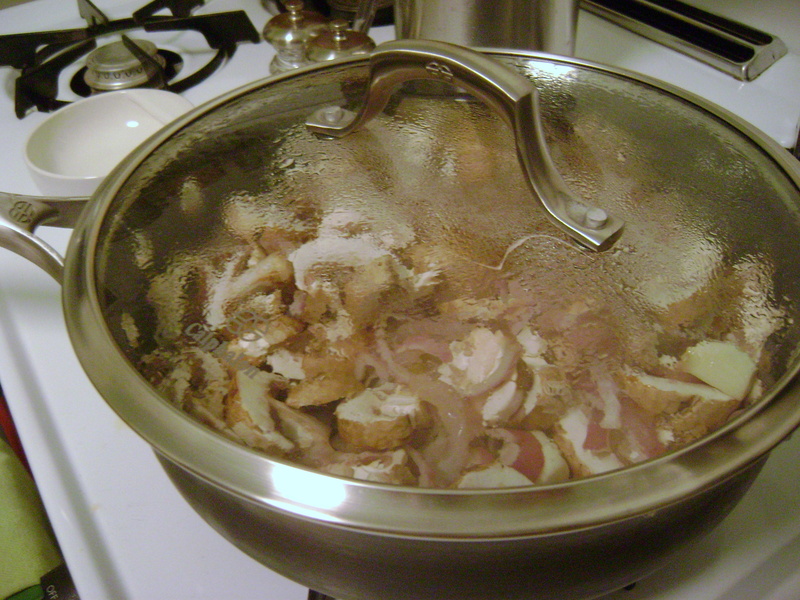 After about 7-10 minutes under there, take the lid off and let the moisture cook away. Lots of pan juice! 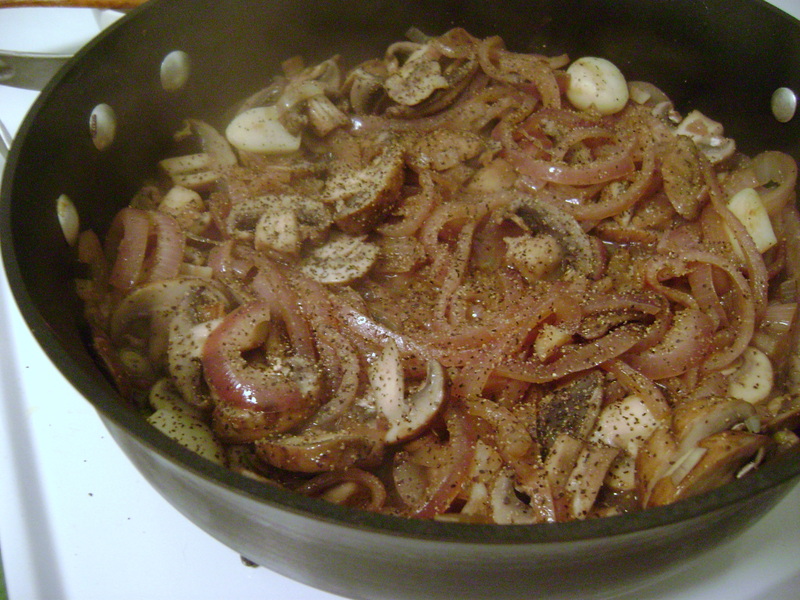 Once the liquid has simmered off, let the onion mixture brown a bit and get tasty. Season well with salt and pepper. (actually the Brown Bear uses WAY too much salt when he eats so I usually skimp on the salt at this point, this dish is way to bad for your heart as it is!) But we both love extra black pepper! 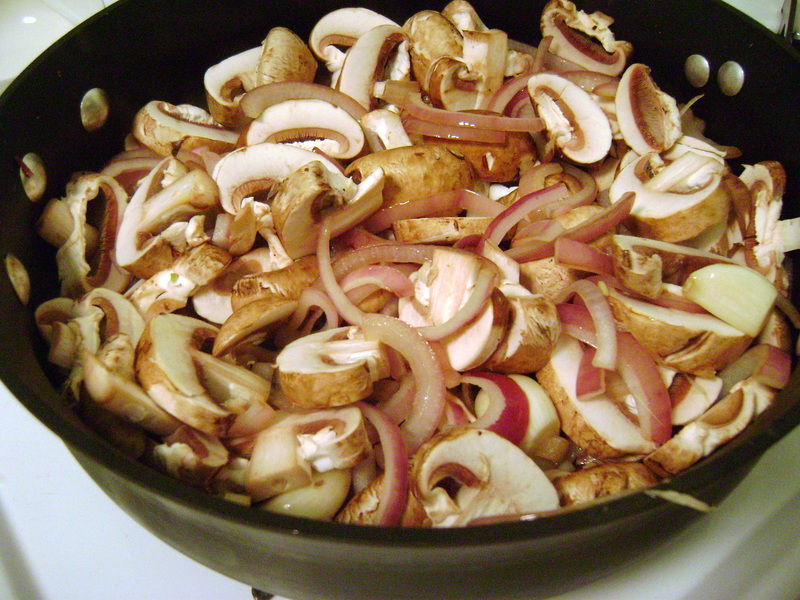 Pour this into a large bowl or a bowl and set aside. Now you will see why I like to leave the garlic cloves whole. 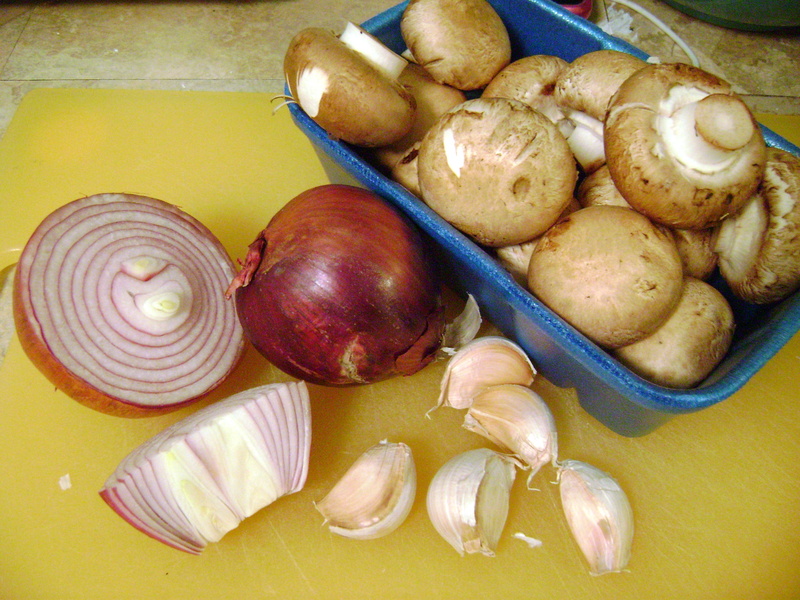 Pick out the cooked garlic cloves and put them back on your cutting board. 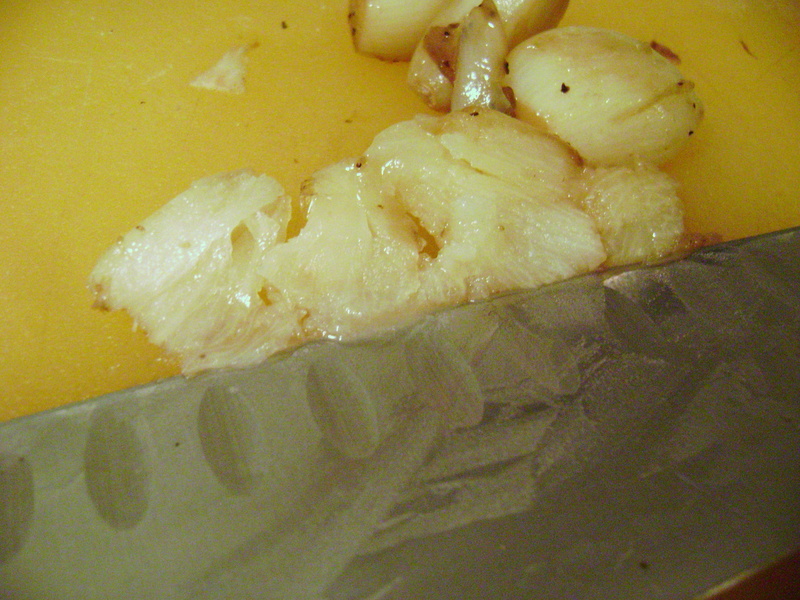 Smash the garlic with the edge of your knife so it is like a paste. A garlicky delicious paste! This will elevate your steak to a whole other level! 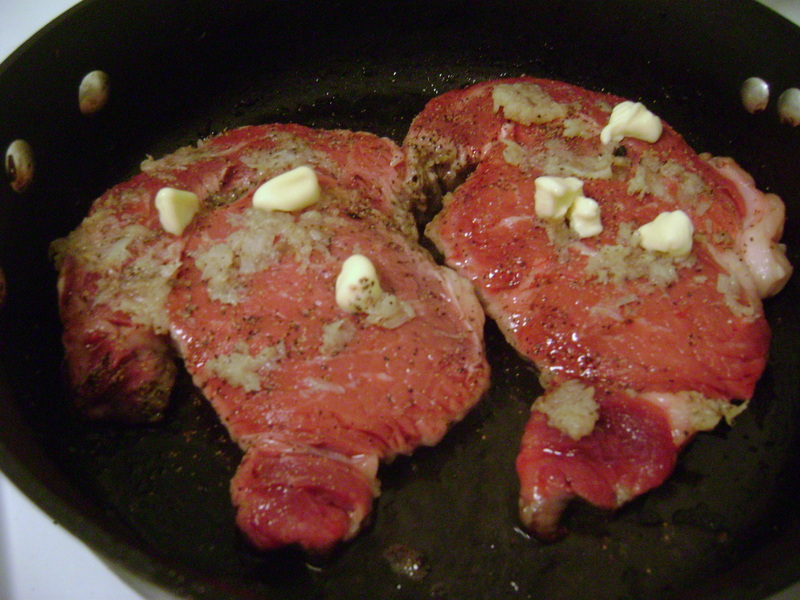 Salt and pepper your meat and cook the steaks in the same (unwashed) pan that you cooked the onions in. I did the big steak alone. 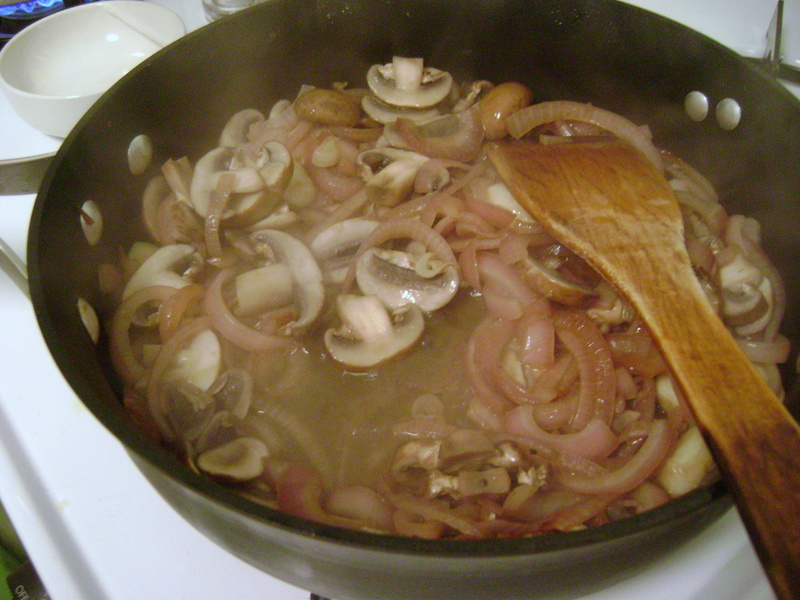 If you crowd meat in a pan it tends to release too much moister and steams rather than browns. 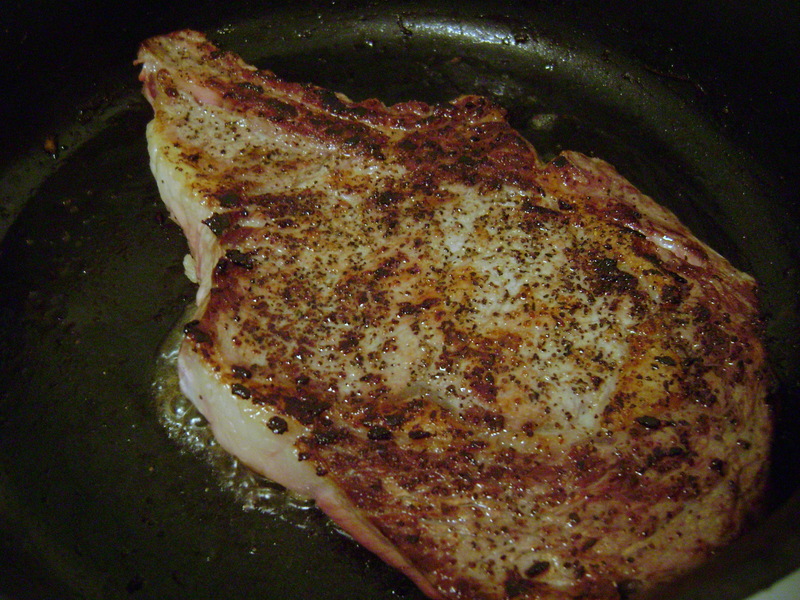 We want a fairly hot pan and we want to sear sear sear! Another no-no is multiple turns. Only turn your steak once and don’t fiddle and move it around in between. Let it set and cook and you will be rewarded by your paitence. As the first side cooks, divide your garlic mash into the number of steaks you have and liberally smear it all over the raw side. 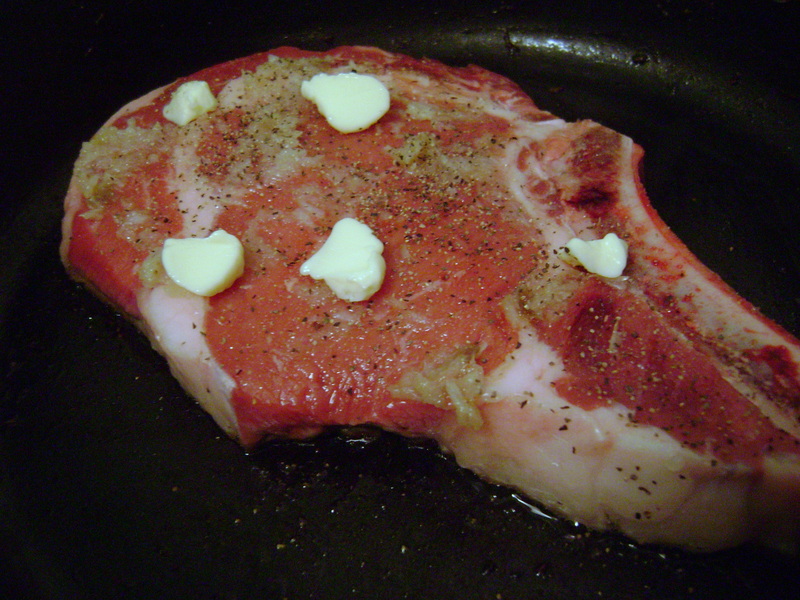 Dot with butter and wait till its cooked to your liking. I perfer med-rare, seared brown outside and pink inside. Its tender, juicy and delicious. 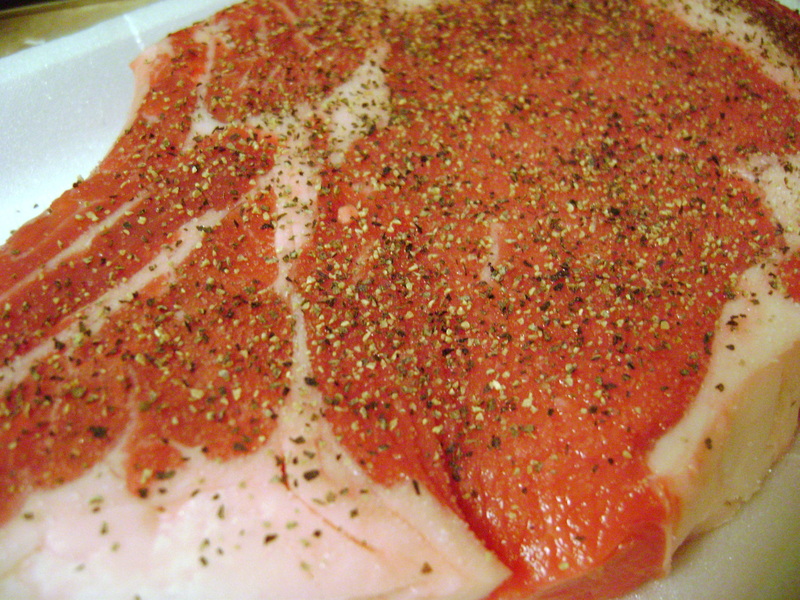 When its time, turn the steak and get ready for oooohss and ahhhhss from anyone who is in your kitchen at the time. Trust me, this is husband/boyfriend/lover gettin food! 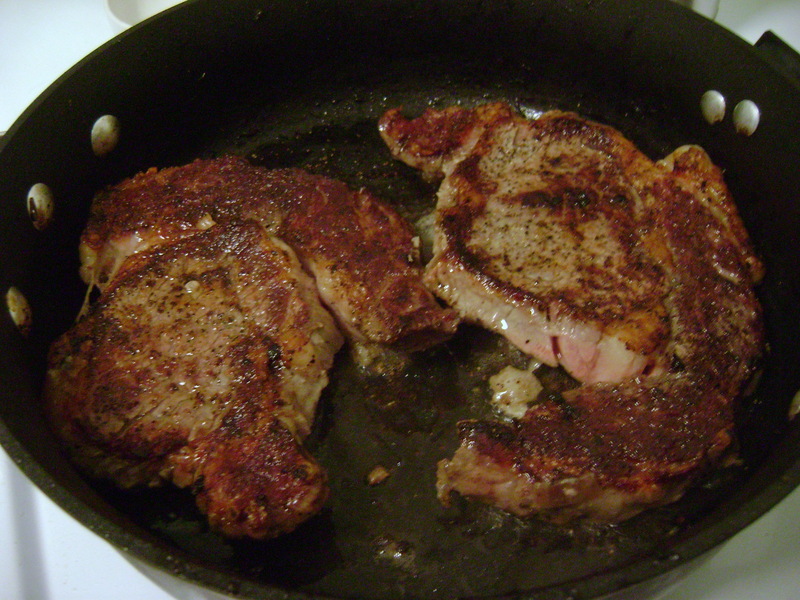 While it cooks on the second side some magic is happening between the meat and the pan. 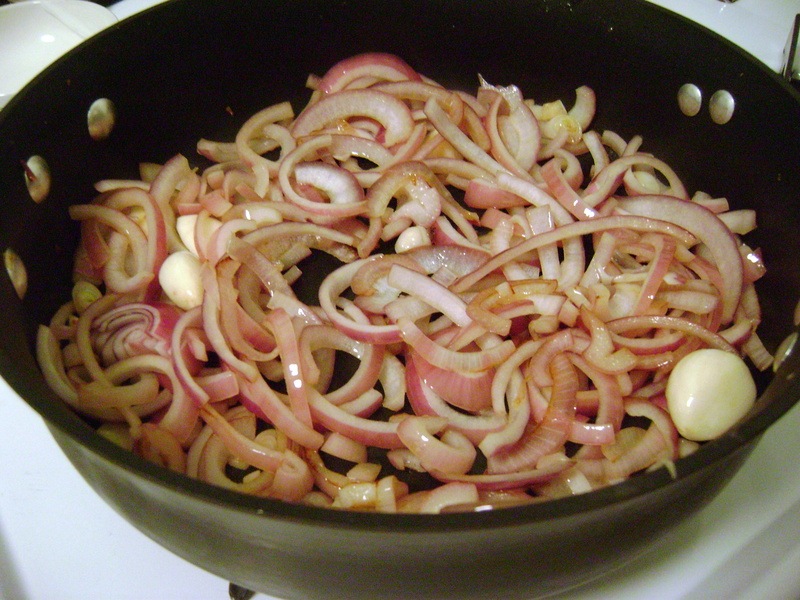 The garlic is cooking in the fats and will become a delicious crispy heavenly goodness. Make sure you scrape up any bits that stick to the pan and pop them back on the steak. 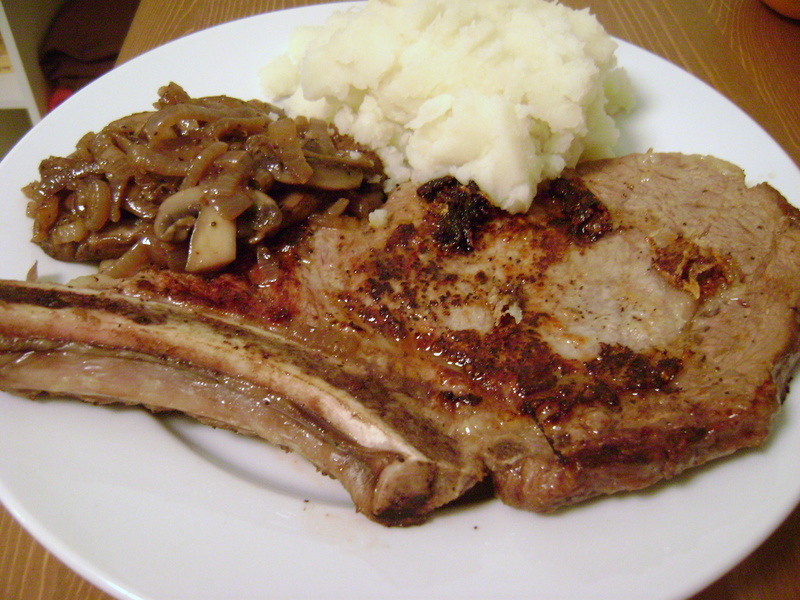 Serve it up with mashed potatoes, the sautees onions and mushrooms on the side and a big salad. Sit back, relax and enjoy this once in a while indulgence.